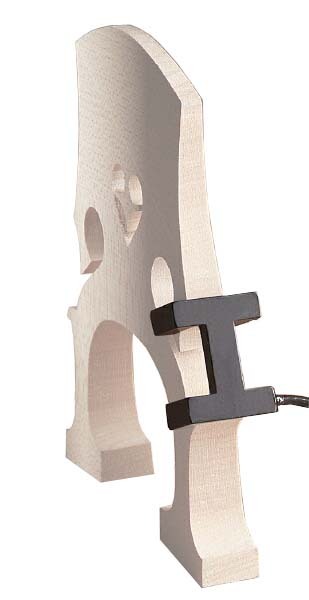 The Barcus-Berry 3125-M Clamp-n Cello Pickup is a replacement pickup for the Barcus-Berry 3125 Cello Pickup system. The 3125-M is designed for miking the acoustic cello without permanently installing a transducer. Clamps easily to cello bridge and removes easily - no drilling or tools needed. This transducer is a favorite for its ability to capture the full musical range of the cello - delicate tones to deep lows. Barcus-Berry 3000A preamp recommended (not included). Includes pickup only; no preamp, jack, wiring or instructions. Bridge not included, attaches to your existing bridge. Pickup lead is terminated in a male RCA connector that plugs into your existing Barcus-Berry or equivalent preamp.